The X-29 Flight Research Aircraft is one of the most unusually designed aircraft in aviation history. In this 1984 historical photo from the U.S. space agency, the X-29 Flight Research Aircraft features one of the most unusual designs in aviation history. Demonstrating forward swept wing technology, this aircraft investigated numerous advanced aviation concepts and technologies. The fighter-size X-29 explored the use of advanced composites in aircraft construction, variable camber wing surfaces, an unique forward-swept-wing and its thin supercritical airfoil, and strake flaps. The X-29 also demonstrated three specific aerodynamic effects: canard effects, active controls, and aeroelastic tailoring. Canard effects use canards (small wings) to function as another control surface to manipulate air flow. Active controls enable an airplane to pull air across the plane in specific directions rather than passively letting the air flow over it. Aeroelastic tailoring allows parts of an aircraft to flex slightly when air hits it in a certain way to allow for maximum flexibility of air flow. 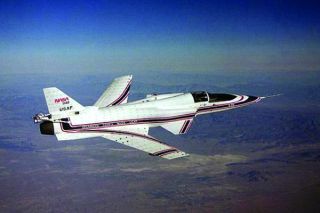 Although the X-29 was one of the most instable of the X-series in maneuvering capabilities, it was controlled by a computerized fly-by-wire flight control system that overcame the instability going further than any other aircraft testing the limits of computer controls. The first flight was December 14, 1984.